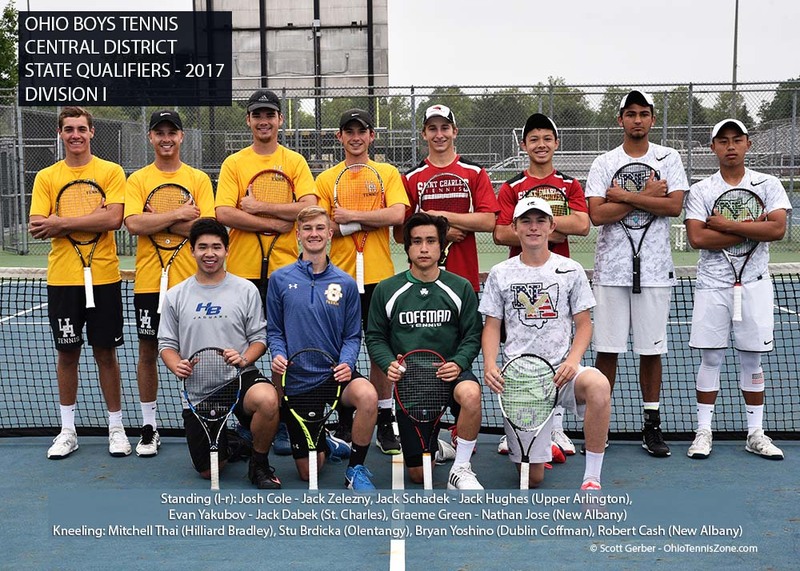 Central Ohio was well represented at the OHSAA State Tournament this school year and in the Ohio Tennis Coaches Association State Team tournament. 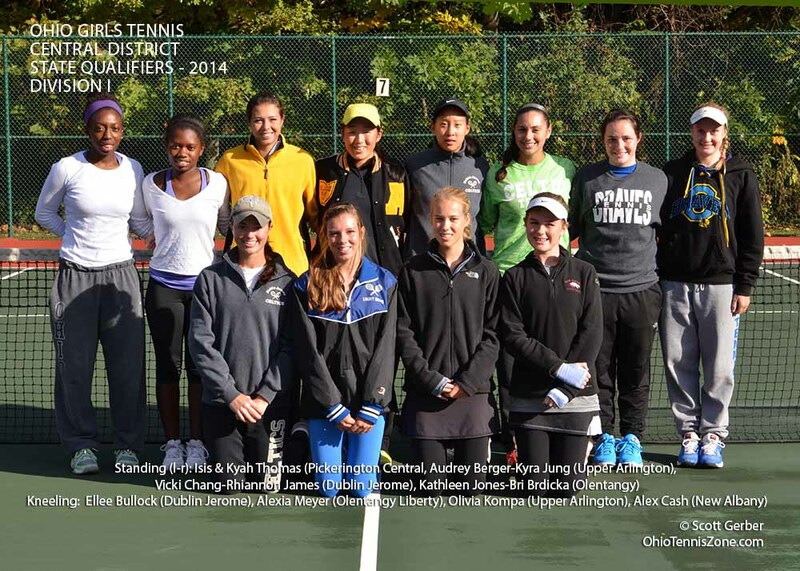 The State Tournament was held at the Lindner Family Tennis Center in Mason, OH. This is the same site at which the Western & Southern Open is held. The OTCA Tournament was held at the Reynoldsburg Summit Station site. The girls kicked things off in the fall. The girls who participated at States are listed in the photos to the right. (Please click on the photos to enlarge.) Centennial's Zoey Weil led the girls by earning third place in Division I. She was beat by the eventual State Champion, Molly Sandberg. Click to view the State Draws for the Girls. 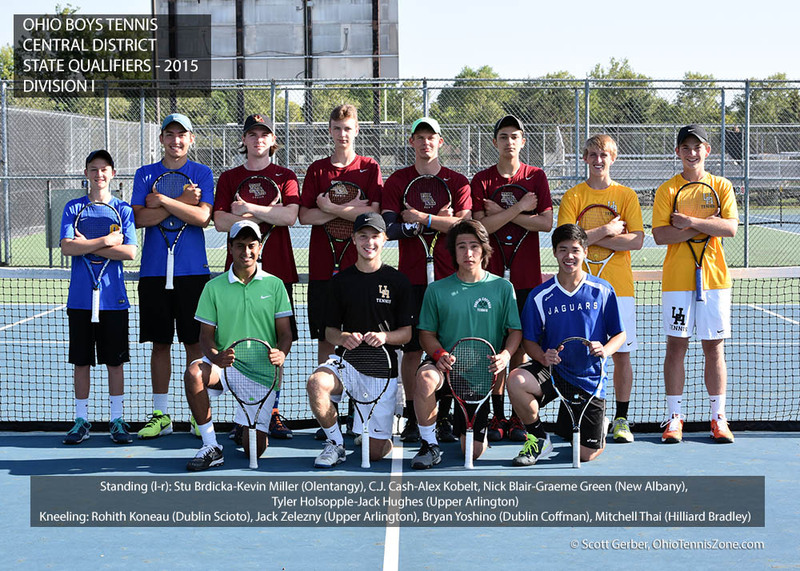 The Central Ohio boys had a great tennis season. It was held this spring. Upper Arlington's Jack Zelezny and Josh Cole were the Division I State Doubles Champions. Hilliard Bradley's Mitchell Thai was third in Division I Boys Singles and New Albany's Robert Cash finished fourth. In Division II doubles, Columbus Academy's Austin Lawrence and Eric Min were Finalists in Division II Doubles. 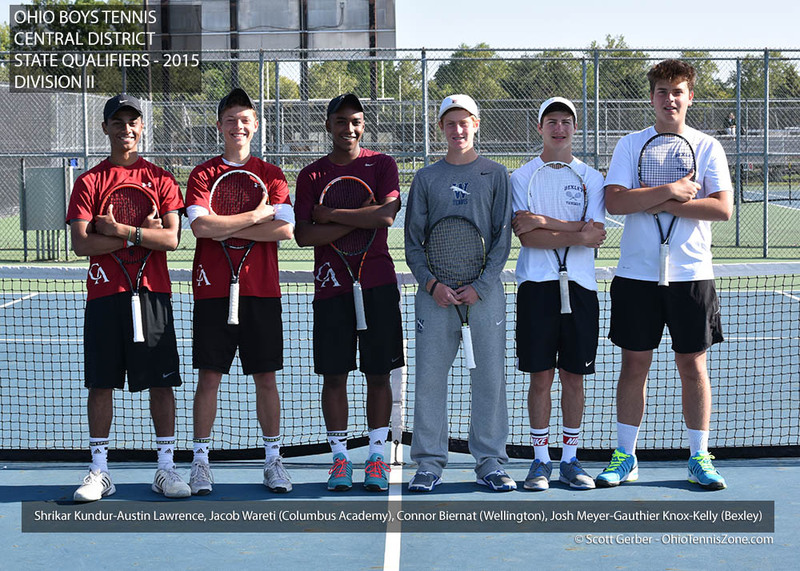 The photos of the Boys State Qualifiers are shown above. Click to view the State Draws for the Boys. 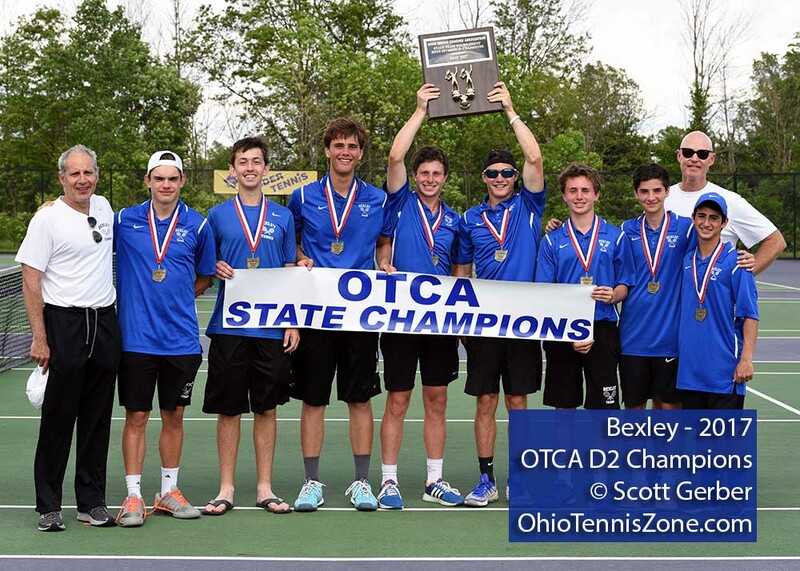 In the OTCA State Team Championship, Bexley surprised the field (and perhaps themselves) by defeating Ottawa Hills, 3-1, in the semi-finals and the expected champions, Hawken, in the final, 3-2. Bexley's Josh Meyer and Leo Schottenstein beat Hawken's first dubs team in a three-setter to clinch the title. Click to view the OTCA Draws. 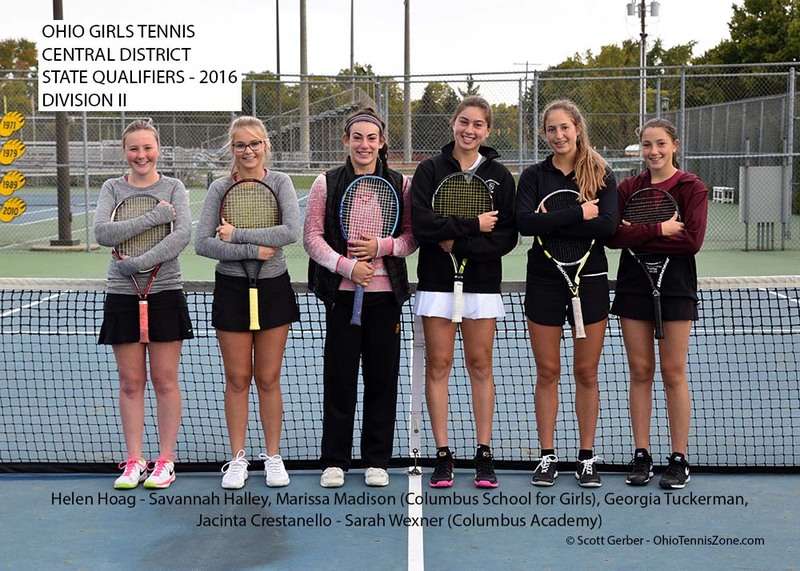 Action photos for all of Central District state qualifiers are included in OhioTennisZone's State Preview Video/Slideshow for the Girls and for the Boys. 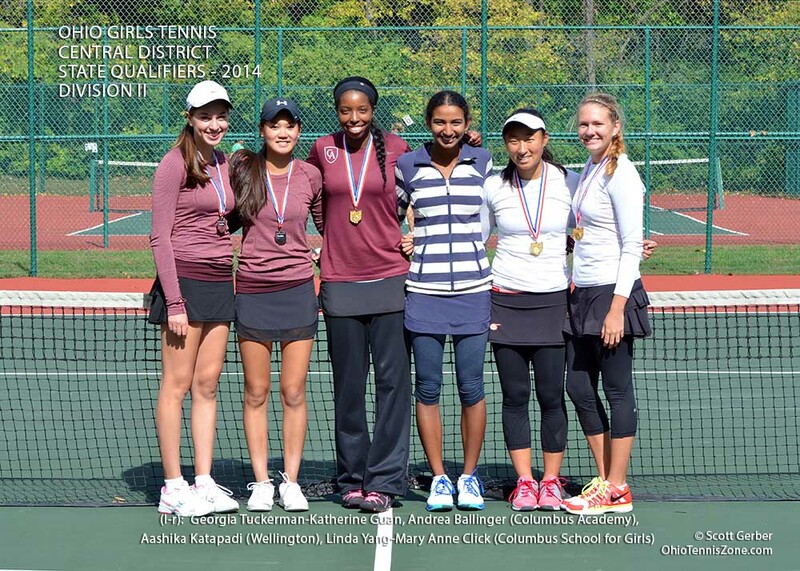 The photos on this page are courtesy of OhioTennisZone.com. The USTA Foundation offers scholarships to high school seniors entering college this fall. The deadline is quickly approaching – Monday, February 27. All scholarship information and applications are online at: www.ustafoundation.com/grants_scholarships/college. Students are encouraged to review the instructions and qualifications prior to submitting an application. 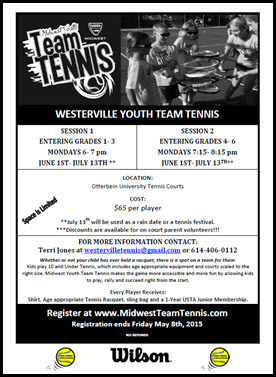 All applicants must reside in the USTA/Midwest Section (Illinois, Indiana, Michigan, Ohio, Wisconsin, and designated counties in Kentucky and W. Virginia). All other requirements and details are available online at www.midwesttennisfoundation.com/scholarships. The deadline to apply is Wednesday, March 1. 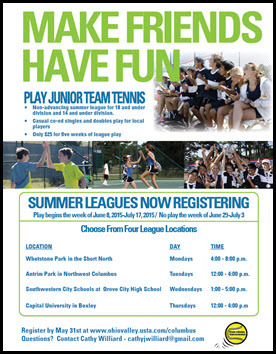 Leagues are now registering for junior team tennis this summer. 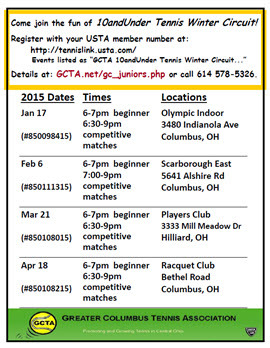 Play will include casual co-ed singles and doubles play for juniors in the Columbus-area. There are two divisions -- 14 and under -- and 18 and under. There are several opportunities to play. They include: Whetstone Park (north), Antrim Park (northwest), and Grove City High School. 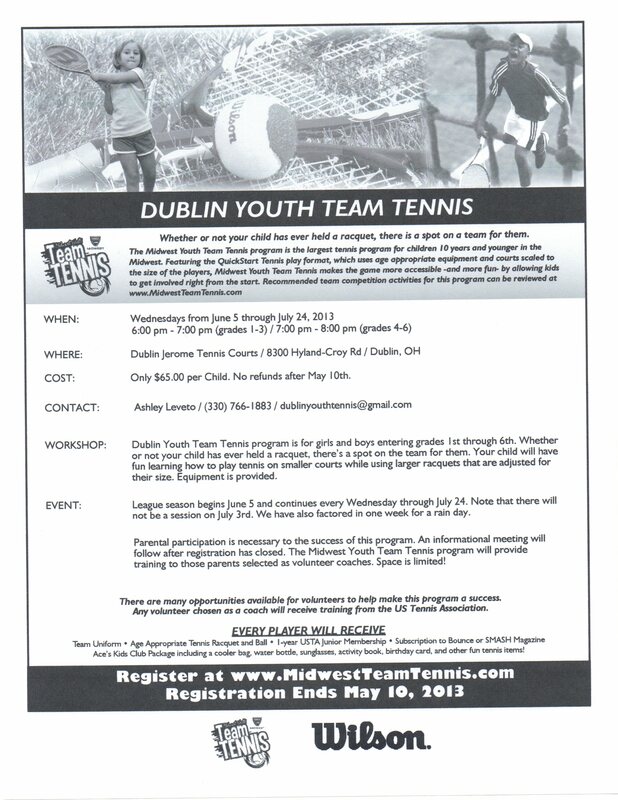 Click to view the flyer for more information about signing up. 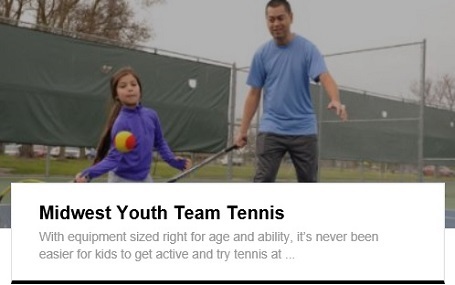 Whether or not your child has ever held a racquet, there is a spot on a team for them. 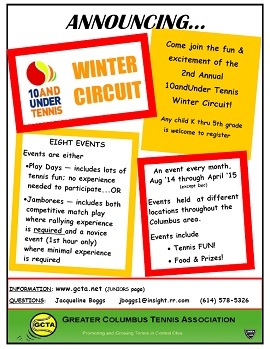 Kids play 10 and Under Tennis, which includes age appropriate equipment and courts scaled to the right size. 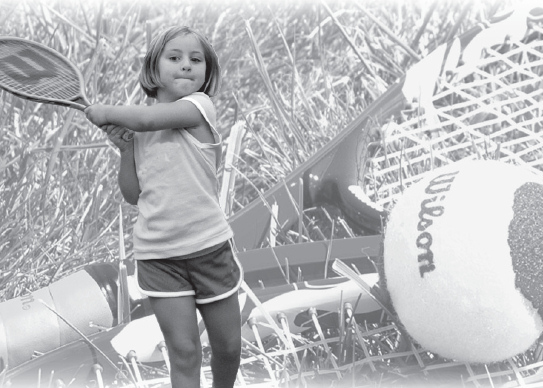 Midwest Youth Team Tennis makes the game more accessible and more fun by allowing kids to play, rally and succeed right from the start. Midwest YTT - Click to signup! We have markets all over the city! 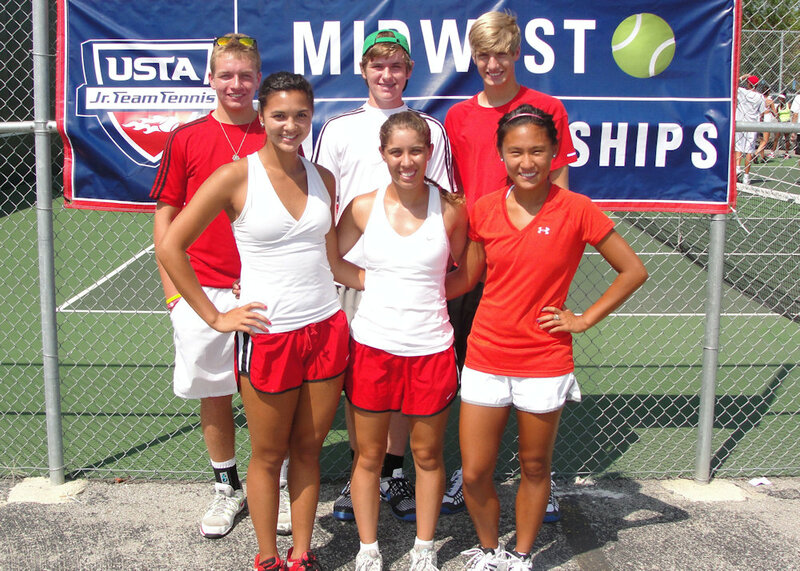 Please visit Midwest Youth Team Tennis to find a program in your area. Space is limited, sign up today! Established in 1992, the USTA/Midwest Tennis & Education Foundation Inc. (USTA/MTEF) is currently dedicated to supporting youth tennis programs, activities, and individuals throughout the USTA/Midwest Section. As the charitable and philanthropic entity of the USTA/Midwest Section, USTA/MTEF is expanding its mission starting in 2017 to service adult populations including Adaptive Tennis, Wheelchair Tennis and Wounded Warriors. 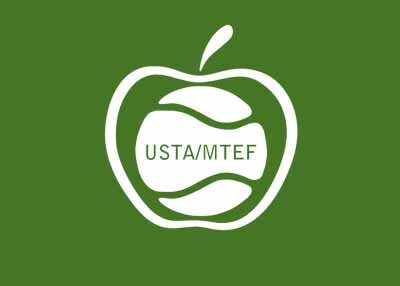 USTA/MTEF accepts applications for grants that fall within the scope of its mission. Applications are evaluated by the USTA/MTEF Grant and Scholarship Review Committee and final decisions on funding are made by this committee Individuals funded by USTA/MTEF must be current USTA members and reside within the USTA/Midwest Section that includes Illinois, Indiana, Michigan, Ohio, and Wisconsin, as well as designated counties in Kentucky and West Virginia. Grants are offered to junior tennis players of all tennis abilities, and these factors are considered when evaluating applications: age, standings, annual improvement, number events played, academic performance, income/financial need, other resources available, and good sportsmanship. The deadline to apply for a USTA/MTEF individual grant is January 1, April 1, July 1 and October 1 each year (please select only one deadline to apply). Applications must be postmarked by these specified deadline dates. Since January 1 is a legal holiday and the post office is closed, the application may be postmarked on the next business day which is January 4. The application may also be emailed or faxed, and would need to be submitted no later than January 4, April 1, July 1 or October 1. Click to proceed to the USTA site for grant application. 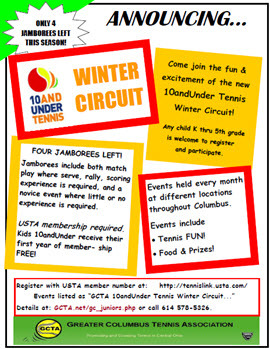 The above text and graphic were provided by the USTA Midwest Tennis Foundation. 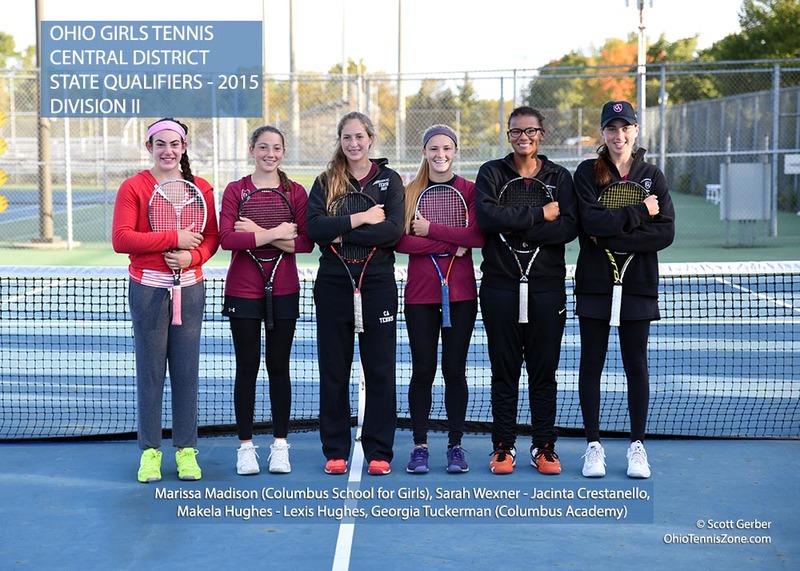 There were 18 girls from the Central Ohio area who played at States. 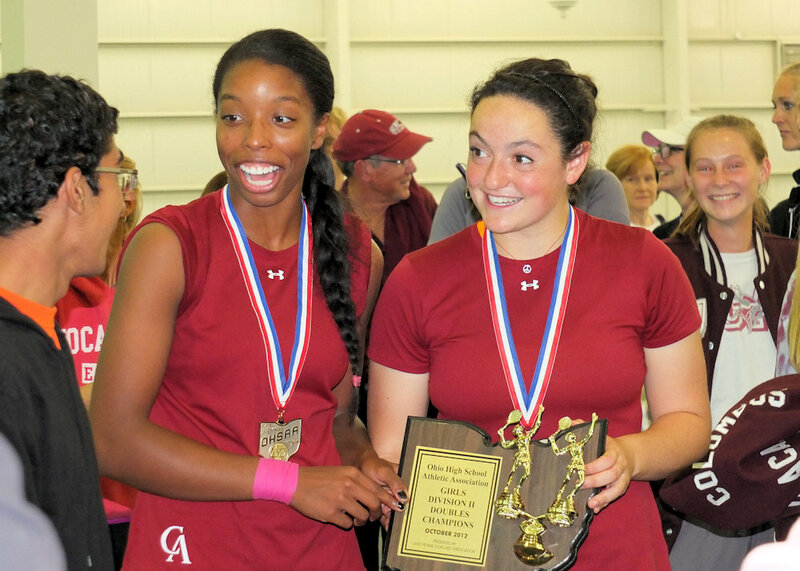 Congratulations to Upper Arlington sister act, Olivia and Paige Kompa, for winning the Ohio High School Athletic Association's Division I Doubles Championship. They defeated Olentangy Liberty's Anna Delaney and Alexis Steer in the finals and teammates, Kyra Jung and Anna Marie Reynolds, in the semi-finals. This was the first time that the State Tournament was played at the Lindner Family Tennis Center in Mason, OH. 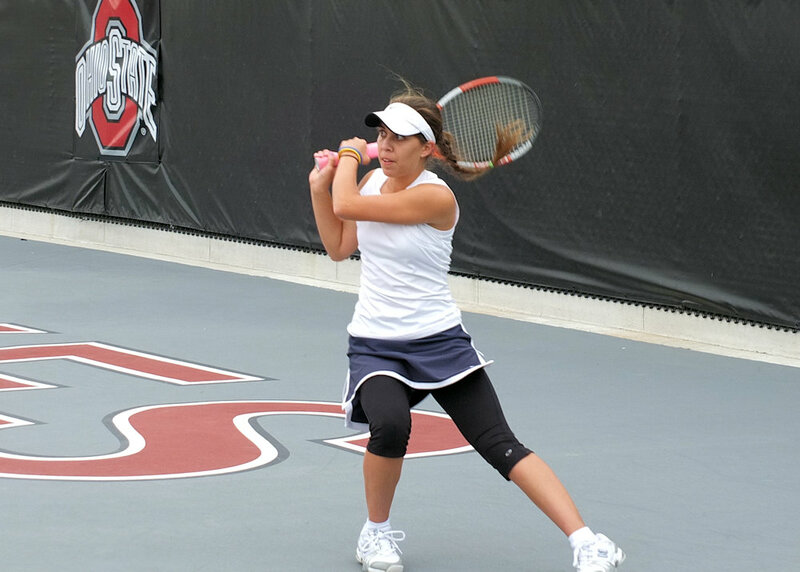 Previous girls championships were played at the Ohio State and Hilliard Davidson courts, with Elysium Tennis serving as the back-up site. 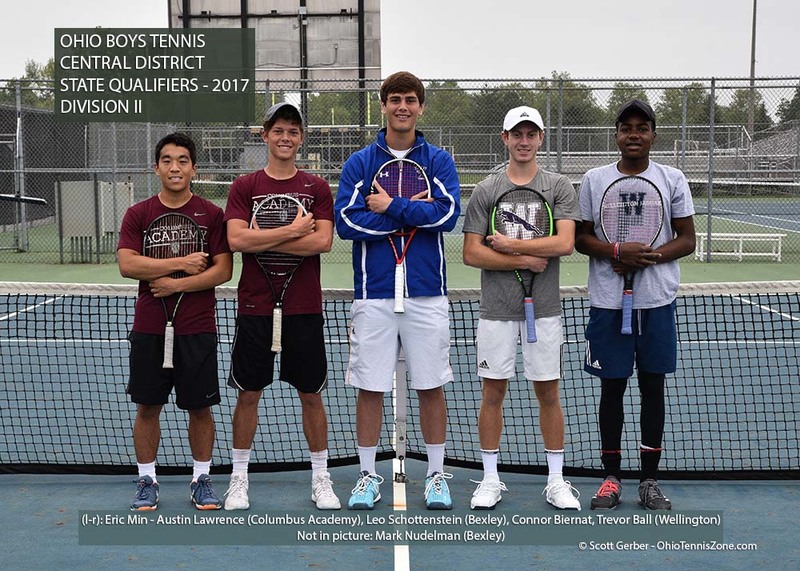 Action photos for all of Central District state qualifiers are included in this OhioTennisZone.com "state preview" video. For the complete results from States, click on the OhioTennisZone.com State Draws. 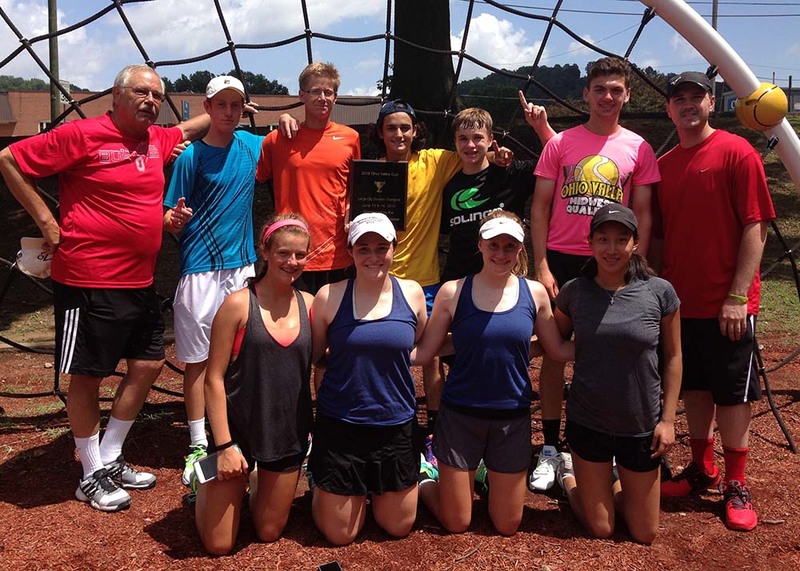 Columbus was once again victorious in the city competition against the other teams in the OVTA. Columbus beat Cincinnati in the finals, 7-3. The names of the players and coaches who participated are: Standing (l-r): Coach Steve Metzmaier, Connor Biernat, Jordan Phelps, Jonathan Zhuravel, Colten Clark, Sam Sullivan, and Coach Tyler Stephen. Kneeling: Alexis Steer, Kathleen Jones, Bri Brdicka, and Vicki Chang. There were 18 boys from the Central Ohio area who played at States. Even though numerous players won their first round matches on Friday, only Columbus Academy's Jacob Wareti reached the semi-finals on Saturday. Jacob won his semi-finals match but he got defeated in the finals against Lexington's Mason Dragos. There are several opportunities to play. They include: Whetstone Park (north), Antrim Park (northwest), Grove City High School (southwest), and Capital University (Bexley). Registration ends on Sunday, May 31st, but space is limited so sign-up now! There are several opportunities to play in the Columbus area. They include: Dublin, Gahanna, Hilliard, Pickerington, Southwest area, Westerville, and Worthington. Registration ends on Friday, May 8th, but space is limited so sign-up now! 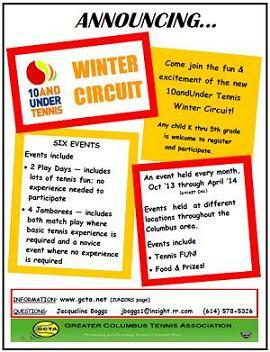 Flyers for the 10 and Under Tennis Circuit are available to download below. Just click on the images to view and then print the flyers. To register for these events, click here for more information. 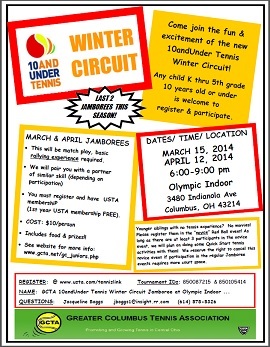 The first Winter Circuit event kicks off on Saturday, January 17, from 6:00pm until 9:00pm at Olympic Indoor. 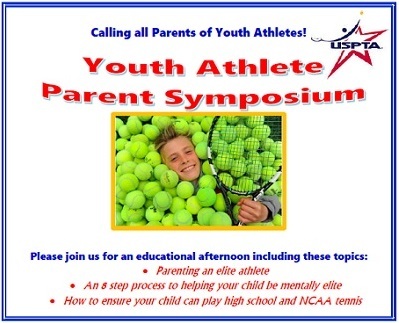 Elysium Tennis is hosting a USPTA Tennis Parent Symposium on Saturday, November 15. Featured speakers include: James Crilley, Dale Carnegie, and and Matt Dektas. The event runs from 1:00-3:30 and the cost is $20. Click to view the online flyer. Email Pam Brady at brady43017@earthlink.com to sign-up. 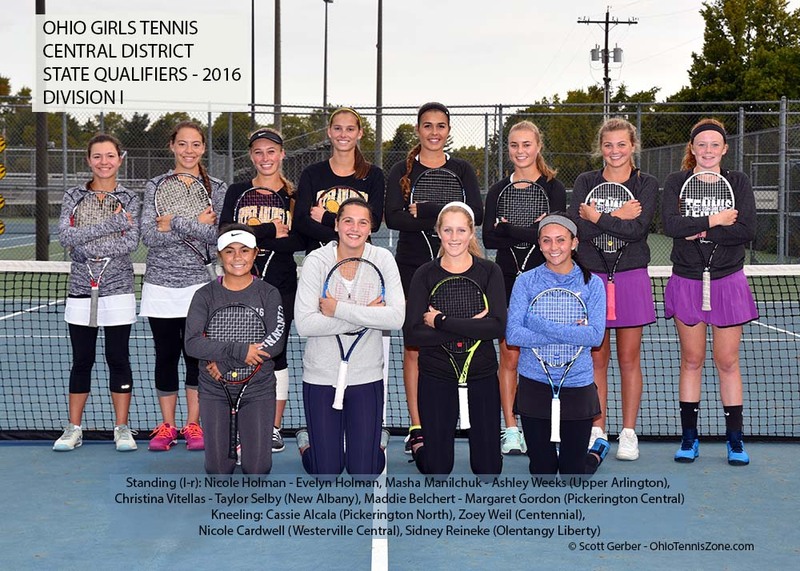 Central Ohio girls were a lock to win the Division I doubles because Upper Arlington faced Pickerington Central in the finals. Both teams were dominant in the tournament -- both won their semi-final matches 6-1, 6-1. In the end, Upper Arlington's Audrey Berger and Kyra Jung defeated Pickerington Central's Kyah and Isis Thomas 6-3, 6-4, for the championship. 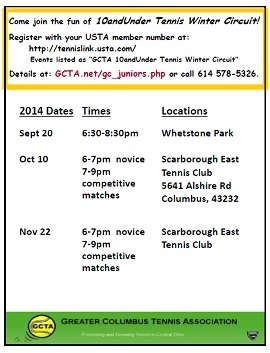 The first Winter Circuit event kicks off on Saturday, September 20, from 6:30pm until 8:30 at Whetstone Park. There is one final event in the Winter Circuit. It will be held on Saturday, April 12, at Olympic Indoor and will run from 6:00-9:00pm. Congratulations to Columbus’ Ohio Valley Cup Team who won the large city division in Parkersburg, W. Va. Columbus defeated both Cincinnati and Dayton to win the division. The team members and coaches are: (backrow l-r) Coach Steve Metzmaier, Nate Wallace, Jeffrey Melvin, Ryan Bibo, Eric Hunter, Coach Tyler Stephen, and (front row) Olivia Kompa, Ashley Thai, Audrey Berger, Rachael Morales. 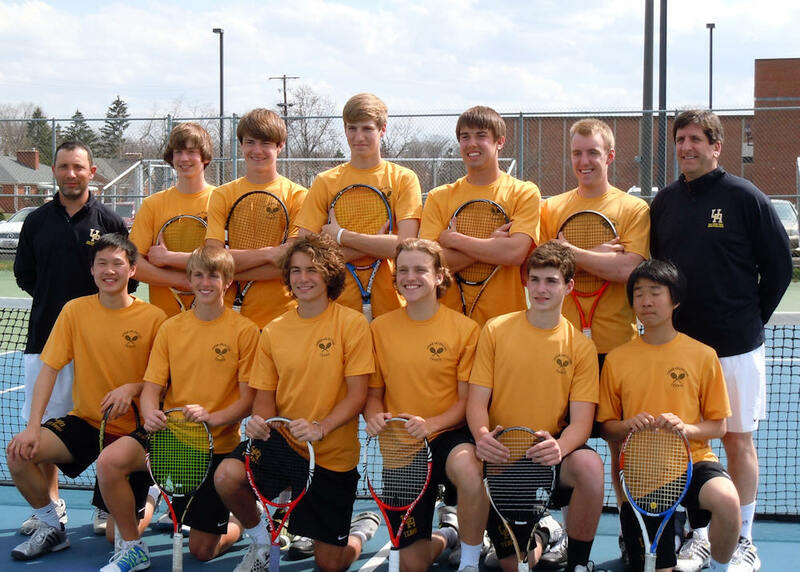 Congratulations to the Upper Arlington Boys Tennis Team. Upper Arlington beat Sycamore and Copley to win the Ohio Tennis Coaches' Association Division I State Championship on June 2. Columbus Academy was the runner-up in Division II. The most important junior USTA tournament of the year is coming soon. It is the GCTA Area Qualifier and the deadline for registration is Sunday, April 28. This is a firm, non-movable deadline so register now. For more information, please click on the link to access the pdf file. While the registration date is the same for all age groups, the tournaments and locations will vary depending on age and gender. 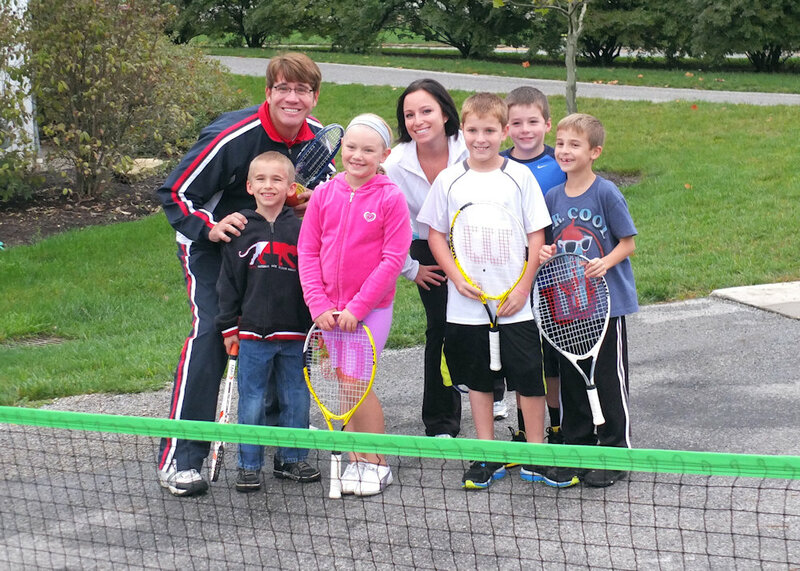 Whether or not your children have ever held a racquet, there is a spot on a team for them. 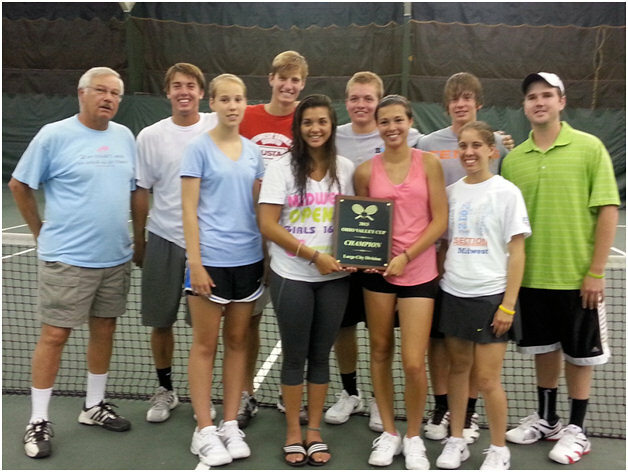 The Midwest Youth Team Tennis program is the largest tennis program for children 10 years and younger in the Midwest. Featuring the QuickStart Tennis play format, which uses age appropriate equipment and courts scaled to the size of the players, Midwest Youth Team Tennis makes the game more accessible - and more fun - by allowing kids to get involved right from the start. 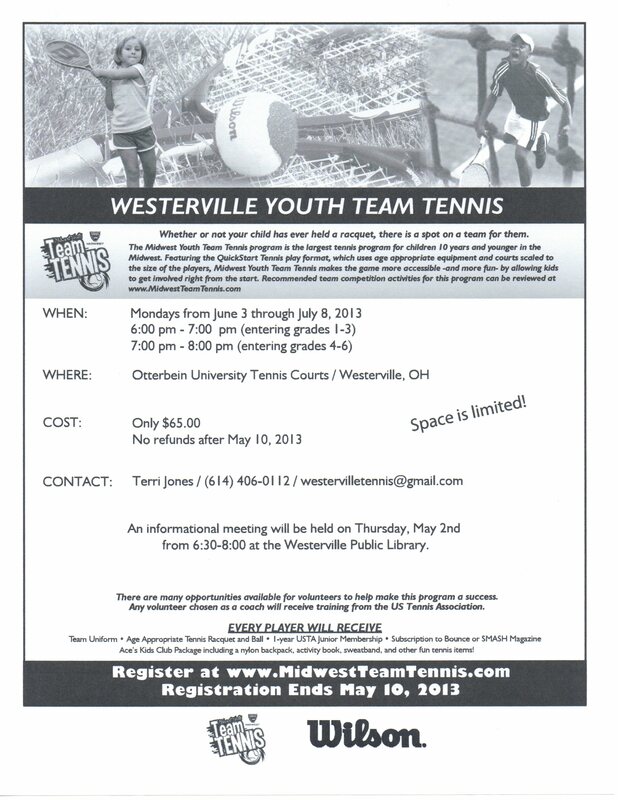 Recommended team competition activities for this program can be reviewed at www.MidwestTeamTennis.com. There are numerous locations in the Columbus area that will offer this program. To find out more about the program closest to you, click on one of the following links: Columbus (Whetstone Park), Dublin, Hilliard, Westerville, or Worthington. Registration ends May 10th, and space is limited. The program starts in June. 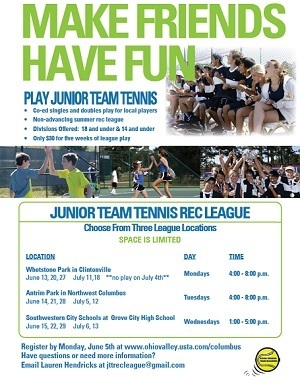 USTA Junior Team Tennis brings kids 11-18 years old together in teams to play singles, doubles and mixed doubles against other teams. It promotes social skills and important values by fostering a spirit of cooperation and unity, as well as individual self-growth. Also, it is a fun environment for kids in which they learn that succeeding is really more about how they play the game – win or lose. 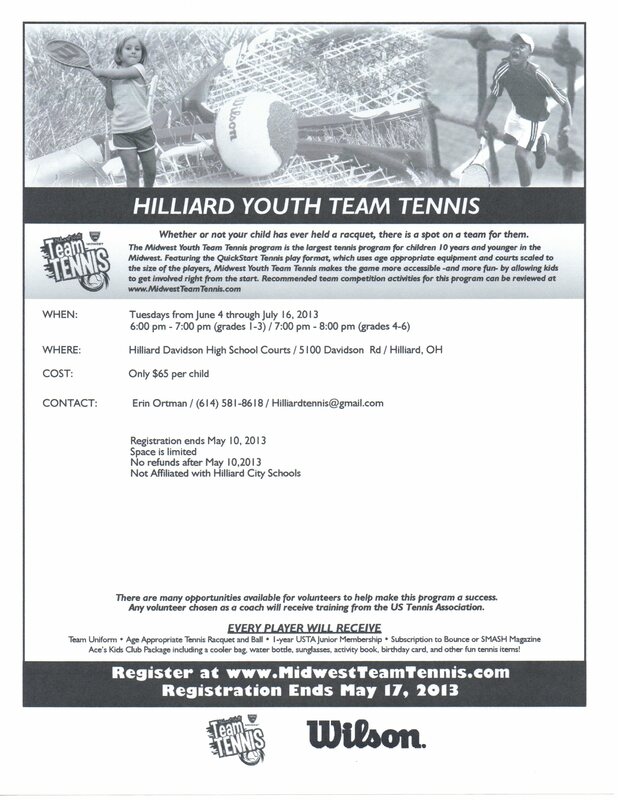 Recommended team competition activities for this program can be reviewed at www.MidwestTeamTennis.com. To find out more information, click on this link. 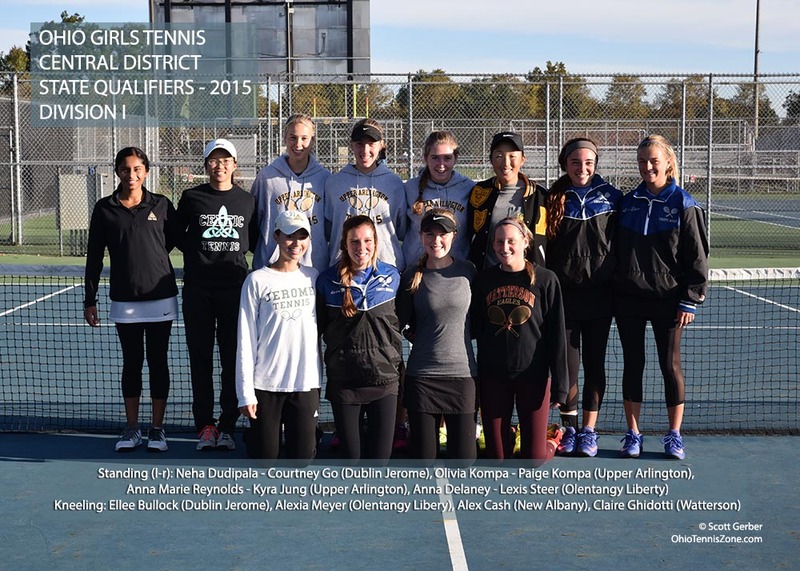 Congratulations to the Dublin Jerome Girls Tennis Team. 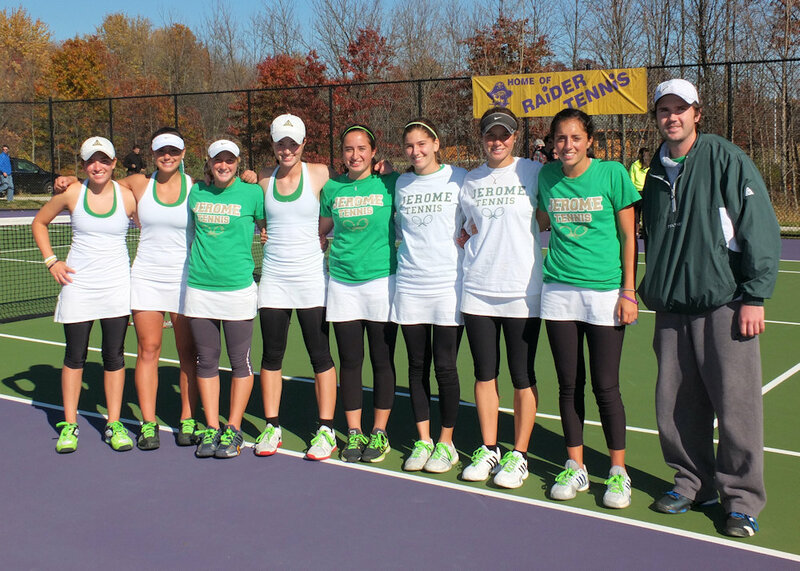 Jerome beat Magnificat and Ursuline Academy to win the Ohio Tennis Coaches' Association Division I State Championship on October 21. Rachael Morales from Bishop Hartley won the Division II Singles title, beating My Linh Li in the finals. Rachael defeated Cincinnati Country Day's Danielle Wolf in the quarter-finals and Portsmouth's Ali Miller in the semi's to advance to the finals. My Linh defeated defending state champion, Rachel Nelson, to earn her spot in the finals. New Albany's Francesca and Cristina Di Lorenzo defeated Dublin Jerome's Sarah and Emma Stein in the Finals of the State Division I Doubles. 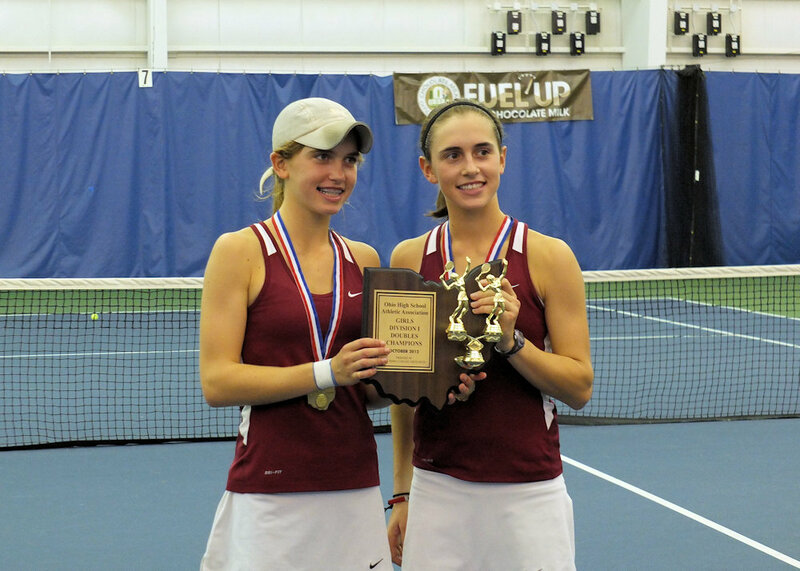 Andrea Ballinger and Hannah Wexner of Columbus Academy won the Division II Double Championship. They beat Hawken's Sydney Green and Emily Leizman in the finals. Thanks to the efforts of the GCTA and the USTA, the Columbus Public Schools agreed to include 10 and Under Tennis in all 84 elementary buildings. The GCTA was able to train the personnel from approximately 70 of the buildings during Capital Day in October and the excitement from the teachers has resulted in a second training after the holidays. This effort alone will reach 27,274 Columbus elementary children. In the picture to the right, USTA Midwest Rep, Jim Amick, leads several, Columbus-area juniors through a demonstration of "10 and Under" tennis drills.